SDW has transitioned to a new method of delivering district supplied Core Apps. Core Apps are applications that are purchased by the district and supplied for every iPad. Previously Core Apps were delivered through an icon on the iPad called Self Service. This allowed the ipad user to download a Core App when they wanted it. The new method of Core App delivery is called MANAGED DISTRIBUTION. This method allows SDW district staff to publish Core Apps to a users iPad and when the user accepts the distribution the apps will install automatically. To be able to receive these Core Apps you must setup your iPad properly. The directions linked here will walk you through the process to receive district core apps on your iPad. Please complete this process as soon as you receive the invite on your iPad. the use of technology. A one-size-fits-all approach is not responsive to those varying views and beliefs. evice: at home, a friend's house, at school, etc. We've developed a series of tutorial videos that will assist parents in setting up these restrictions on the iPad. Prior to viewing the videos, we want to be very clear on one element. Restrictions passcodes, if lost or forgotten, cannot be reset by the district. As a result, the device needs to be completely cleared and data can be lost if it is not properly backed up using iCloud. We STRONGLY encourage you to write down the Restrictions passcode when you set it to avoid this issue arising for your son/daughter. In this video users will learn how to set a wide variety of restrictions on the iPad. Having trouble with misuse of a specific app on the iPad? Delete the application from the device (press and hold until the apps wiggle and then click "x" on the app). Taking the restrictions one step further, users will learn the different web filter settings that can be configured on the iPad. Learn to lock accounts on the iPad and to turn off services like iMessage. In an effort to keep unwanted Restrictions at bay, some students have set Restrictions on their own device. These restrictions tend to be very liberal and may only serve to restrict parents or teachers from setting more stringent Restrictions, which is exactly why some students are self-imposing them. 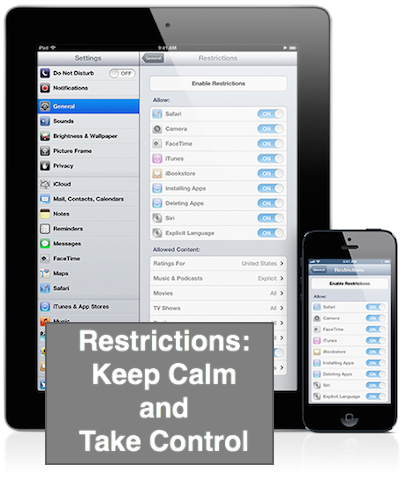 1) Contact an administrator at your child's school to determine if they have knowingly set any Restrictions on the iPad. If so, you can discuss as a team what the appropriate device Restrictions should be to suit the child's and family's needs. 2) If the administrator has not set the Restrictions, the next step will be to connect with the point person in your child's school (the administrator should be able to assist in determining who that is) to determine how to unlock the Restrictions code and to properly reset the code so only the essential adults are aware of that Restrictions code. - Restrictions will most likely be able to be unlocked electronically using the district's management software. The Restrictions code can be reset so only the essential adults are aware of that code. An Apple ID is a username that allows access to all of Apple's services. Students must have an Apple ID in order for it to backup data located on their iPad. This is your child's "professional Apple ID" (similar to their school district gmail account) and will be with them their entire career in the School District of Waukesha. Please rest assured that your child's teachers will be your partner in taking an active role to educate and monitor students in the appropriate use of this technology. Contact the SDW HelpDesk at 970-1073 to reset the AppleID passcode or contact your student's school building iPad support person. Many internet service providers have content filtering available on their service. Most also have directions for setting up your routers to provide content filtering. Be sure to check whether the filtering works only on connected devices or is available for wireless devices. It is also important to check which type of devices are being filtered. Contact your ISP or visit their website for more information. One site that offers free filtering for home users is Open DNS. Their filtering works on a majority of devices, connected or wireless, including the iPad. The video linked below demonstrates the power and ease of use for Open DNS.